Well said My BROTHER!!! As a Divorced mom (Raising a 20 year son in college) I know all too well the void not having a father in the home can leave! Kudos to tyou for being brave enough to take a righteous stand on a very sensitive topic. I can teach my son many things, but I agree with you I can not teach him to be a man. Strong black woman I am , but MAN I definately am not! Stay blessed and keep speaking Truth! Earthly parents have a responsbility to point their children back to our original Father, to bringthem up in the fear and the admonition of God. In an “ideal” world, this would be ideal but it is not…it is filled with self-seeking individuals who are so consumed with their own agenda that the Father remains hidden in plain view. It is only in our turning to the Father that we are able to embrace our true identity in God through Jesus Christ. Through our renewed mind that we are able to see as God intended. Is my mind renewed? Do I have the correct perspective of God as my Father? Am I truly in relationship with Him? Or has the conditions that I was borne into temporarily clouded my vision? From my own experience, I can see the importance of a child knowing its identity for the lack thereof creates a life of searching which is why it is so important for us as parents to teach our children about God, to keep them in remembrance of Him so that those things which He spoke into us before we came into this realm remain clearly visible as we walk out our purpose. Both parents have this responsibility in different forms and in the absence of either of the two, God is sovereign. I hope that as we look at the dynamics of the family we do not lose sight that this world is speaking its truth which a lie and ask ourselves….am I speaking His as it relates from the Kingdom of God who is the same, yesterday and forever. Great article! everyone has a role to play in life and when people fail to function in their divine role, abuse and chaos is inevitable. My utmost respect to all the single parents both fathers and mothers trying to do the best they know how to raise children. However there is a danger of overcompensating for the lack thereof . You have touched on so many subtopics under the root of people creating their own definition of Fatherhood. Some companies that are seeking a profit are willing to distort what they can. We as Christians must be the watchman on the wall and let them know that the card is not acceptable. 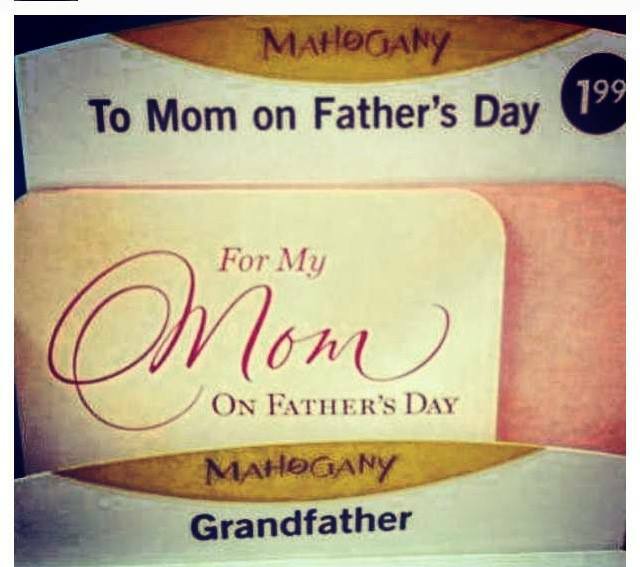 Ultimately what becomes the norm in society is driven by profit and people speaking up so regardless that it is past Father’s Day I think this blog should be sent to Mahogany along with other emails and letters. I promise you if the cards were a hit there will be more next year so let’s join in and STOP the snowball before it really starts rolling.If we are not pointed back to the Love of the Father then we are lost. An excellent post! It’s the pure truth. The cycle of absentee Father’s and Mother’s that hinder the relationship between the Father and their children as well as other issues must be broken. All parties involved must take responsibility and begin restoring what has been broken for years. There is a Fatherless generation in need of healing.